I’ve been told that the only thing I post about nearly as much as my daughter is beer. Why disappoint? This past weekend we had a great get together with a bunch of my MBA classmates and their significant others. 15 adults. 9 kids. Times have changed. To make sure we had enough time to actually enjoy each other’s company, a genius weekend attendee suggested we hire a professional chef. And like that, brunch, dinner, and dessert on Saturday were fully covered. 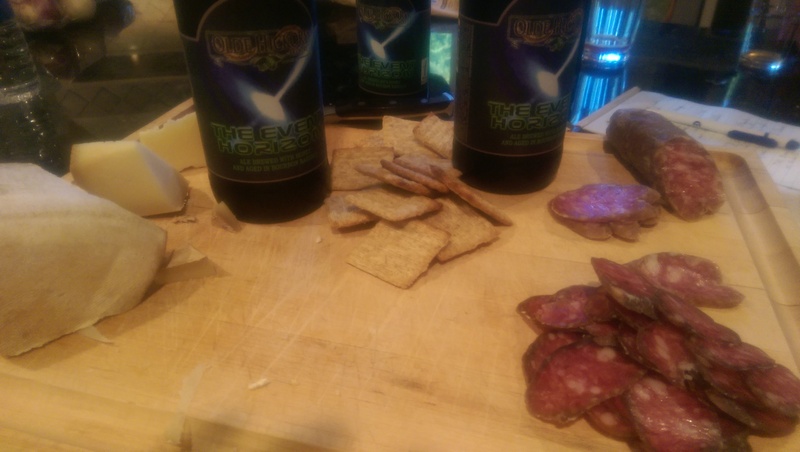 To fill in the gap between lunch and dinner, I decided to pull together a beer and cheese tasting for the crew. I’ve always paired my beer pretty well with food, but I never thought of it in sequence and for such a wide array of palates. I was super happy with the results. Why? Don’t underestimate the cider and presume it to be sweet. What I love about this cider specifically is both the maturation as well as the oak barrel aging, both of which turn the cider into more of an oaky white wine than a pressed cider beer from apples. The complexity is still there and it makes for a great seasonal transition drink, between the crispness of Summer and the earthiness of Fall. In this case, you want a creamy cheese that doesn’t dominate your palate and that is complemented by the sharp bite of the cider. The truffle honey was added to complement the oak flavor imparted on the cider by the barrel aging process. The one thing I could have done was better manage expectations about the cider; as hard as I indicated it would taste more like a wine than a typical cider, it was hard for some to process. Regardless, the result was a great start to our tasting. Also, I believe everything I just wrote above. If it sounds hokey, get off my blog. I wrote it after closing my eyes and reminiscing of the flavors. That pairing was legit! Why? 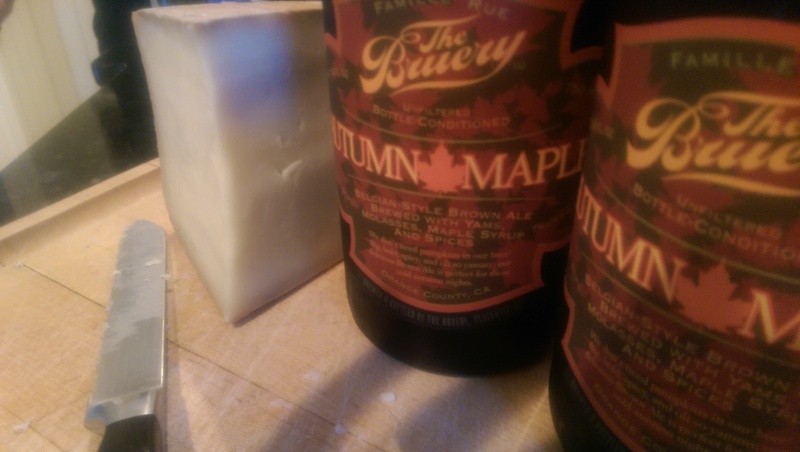 If you haven’t had the Autumn Maple, stop, and go get it now. I think it’s as good a beer as The Bruery makes and there’s not much more time left to get it. With the Autumn Maple you’re drinking Thanksgiving. Nut Brown Ale with yams and maple syrup. It’s a beautiful thing and I feel like something that is this sweet should not be drinkable in such large quantities. But it is. The sweetness hits you fast but vanishes behind all the remaining flavors and before you’re finished enjoying what passed you’re back to your glass for more. There are some cheeses, IMHO, that pair really well with sweetness. Some say Brie, but I believe in many cases Brie becomes a vehicle for the fruit, adding some texture but little flavor complexity against strong competition. 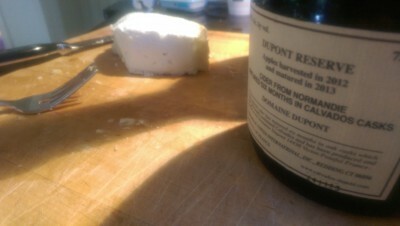 So in this case, I had to go sheep’s milk and the Pyrenees Brebis. I wanted butterfat. It’s that simple. I wanted everyone to taste the butterfat and have that lingering fat and oil on their tongue as they enjoyed the nutty base of the ale, followed by all that additional flavor. 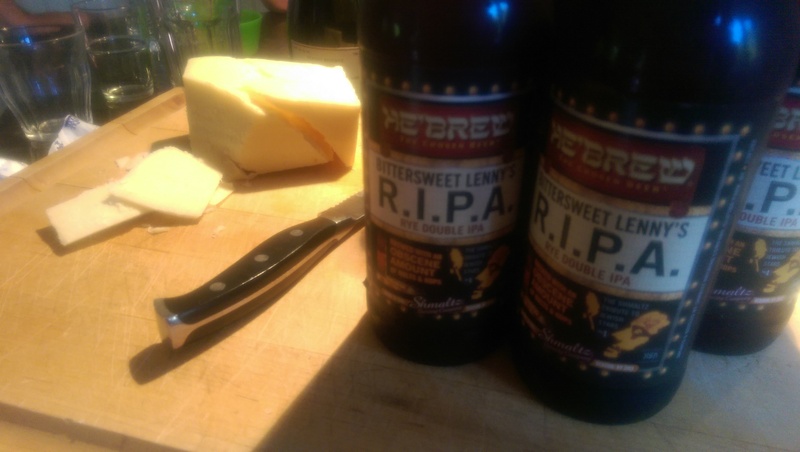 It’s not an easy cheese to like, as well, so I had to pair it with the most forgiving of beers for newer palates. Why? Few things stand up to a BBA Stout like this one, and the chocolate covered bacon I tried to make didn’t turn out right. The Event Horizon is up there. It’s the beer I’ve experimented the most with on the pairing side because of the way they release this beer in Charlotte, NC — a full on breakfast that incorporates The Event Horizon flavors. It’s sets the mind rushing. I was originally going to pair this with the other cheeses as well, so people could get contrast and understand what beers do to cheese, and vice versa. But when our chef brought out the big guns on the sausage side it was a no-brainer. The flavors that come from malt and roast pair beautifully with cured meats. The bourbon finish of the beer and lingering heat also pairs well with the fat and salt associated with the cured meat. I recommend it. I was happy with the pairing. I was happier to have shared with the Fuqua crew. Can’t wait to do it again. Maybe a harder push on the Fall Seasonal? Who’s up for it? I didn’t have a ton of time to make something worthwhile for a relatively impromptu BBQ with some friends today. Thanks to all of you readers for pointing out that the nature of an impromptu BBQ would imply little prep time. Nevertheless, it’s the least prepared I’ve found myself to be. And with a 6 month old daughter constantly in tow at this point, there’s not a lot of room to rejigger the schedule. Folks were coming to the BBQ prepared. From salads and apps, to grilled veggies, steak, and ribs. What could I make that would fit the theme and make most in attendance happy without taking up my entire morning. 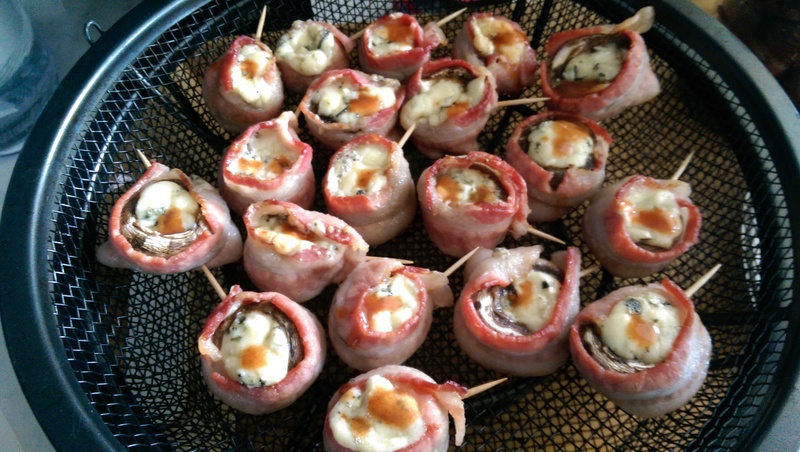 I’ve made stuffed mushrooms on the grill before. I usually go with Parmesan cheese to give the mushrooms a depth and sharpness you can’t get from cream cheese, ricotta, or even mozz. Today, however, I was inspired to try something different. The results are what you see below and I’d recommend this recipe to anyone. Soak the toothpicks in water. The longer the better. Set oven to 350. Insert baking sheet, but go with one that has a sizable lip so the remnant oil from the bacon stays put. Prep mushrooms. Brush the dirt off. De-stem. Stand in baking sheet. Cut bacon in half. Take the strips out of the package and cut them in half. Traditional bacon strips cut in half should wrap 1x around a mushroom with some overlap. Wrap mushrooms. 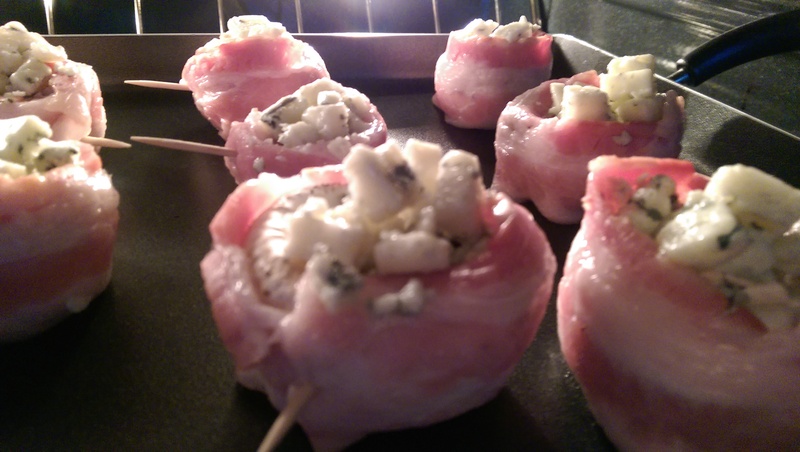 Wrap each mushroom with bacon, then stick a toothpick in at the point of overlap to hold it. I recommend sticking the pick in at an angle. Stuff mushrooms. Fill it with blue cheese crumbles. Be generous and don’t worry if it overflows the top a bit. 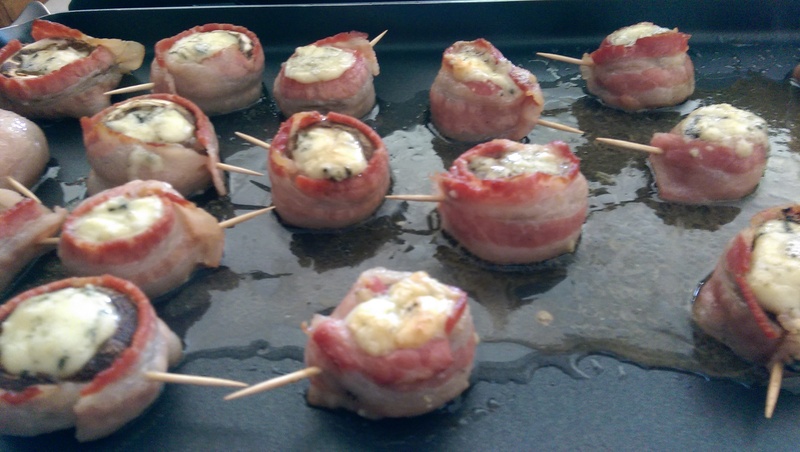 Bake mushrooms. I’d go for 20 minutes. If you’re going to finish them in the oven I’d go 20, then remove, clean the baking sheet of the residual oil, and bake again until all is crisp. If you’re finishing on a grill, I’d go finish them on indirect heat on a grill for another 10. Douse with hot sauce. This is a difference maker and I highly recommend finishing it with hot sauce. It will add an acid to cut the fat and will brighten up the dish. I had a really special motivation for giving a sweet, bread pudding a shot. I’ve made savory ones. I was actually supposed to make a savory one to accompany this. But instead, I screwed up the recipe by going a little too rogue and a little too Colin Mochrie, and improvising my way from a bread pudding to a mini casserole. Tasty. But not a savory tomato, basil bread pudding. Thankfully, this recipe isn’t about that recipe. 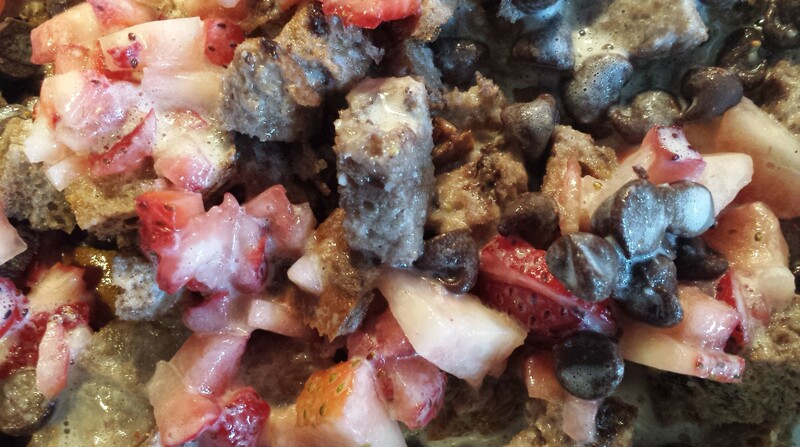 It’s about my own take on a bringing a chocolate covered strawberry to life in the form of a bread pudding. I think with an iteration or too, this can improve. But from concept to dish, I’m pretty happy with it. I hope the beneficiary finds some comfort in the ultimate of comfort desserts, as well. The key thing for me was making this taste like a chocolate covered strawberry–which means for all the decadent chocolate, there had to be an underlying fruitiness and tartness in contrast. How’d I achieve it? By making the custard, and then stirring in a blended, half-a-basket of fresh strawberries (with a touch of sugar and milk to keep the blades whirring. Here’s the full recipe with some photos. Cut the bread. 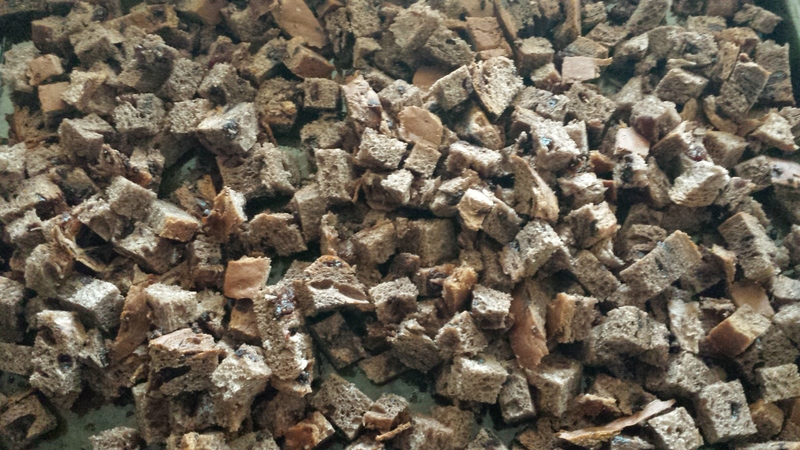 Most folks I’ve spoken to about bread pudding go with 1″ cubes. For dessert? I say go with 1/4″ to 1/2″ because you have more flexibility on the presentation (muffin tins, casserole dishes, etc.) Lay them flat on a cookie sheet and bake for 10 minutes at 200 degrees. The goal is to dry out the bread, not necessarily cook it. Prep your strawberries. 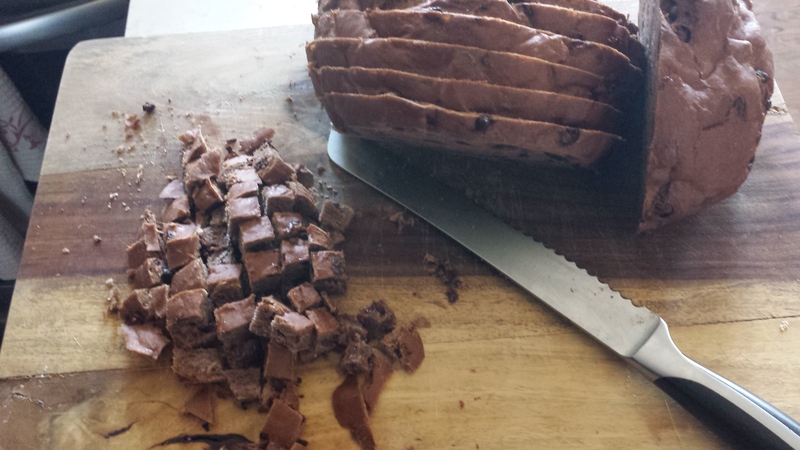 Cut half of the bunch into odd size chunks that you can stir throughout the pudding. Take the other half and put them into a blender and whir like the Dickens. This should be straight puree; something you can fold into the custard base for your pudding. Taste it when whirred. If you like it, great. If you want more tart, add lemon. If you want more sweet, add sugar. You get the drift. If you want more of something, screw nature and make it taste the way you want it to. Get your base ready. There are so many ways to make bread pudding. The easiest way for me to remember how to go about it is to think ratios: 1 cup milk to 2 eggs (1 full egg, 1 yolk only) to 3 cups bread. For this recipe, you see the ratio in the Ingredients above. Put them in a bowl. I don’t think you need any other flavoring here but if you want to toss in some sugar, salt, lemon, vanilla, and even a shot or two of bourbon, have at it. Once these ingredients are together, froth it like your favorite barista — a hand or immersion blender is your bff at this point. 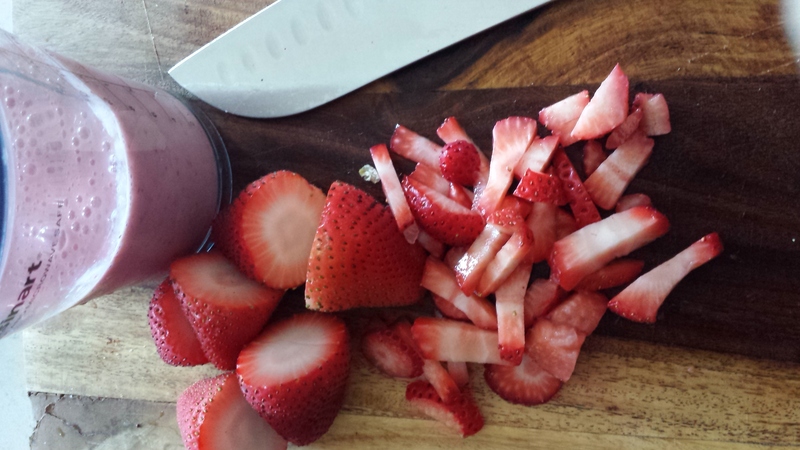 Blend first without the strawberry puree, and then do a second blend after pouring in the puree. 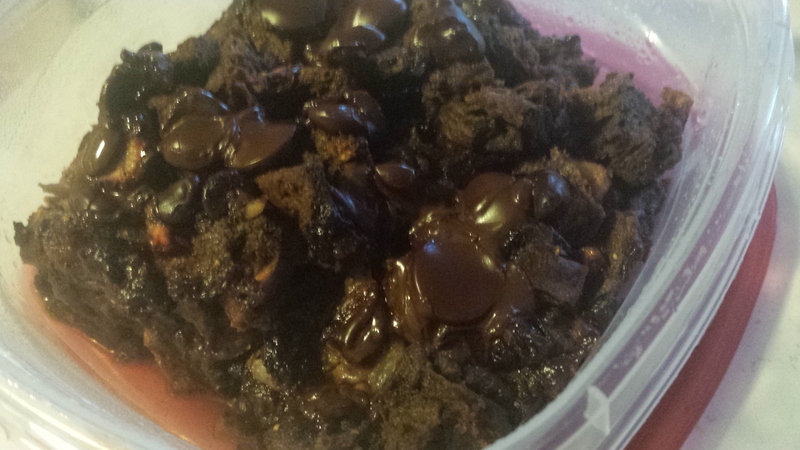 This is the genius of my recipe. Strawberry all up in this house now. 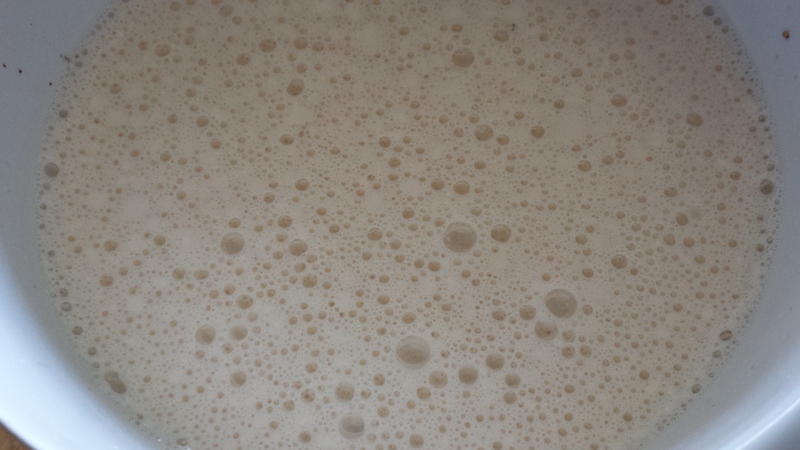 Grease a baking dish (9×12) to start. Put in the bread. Go one layer. 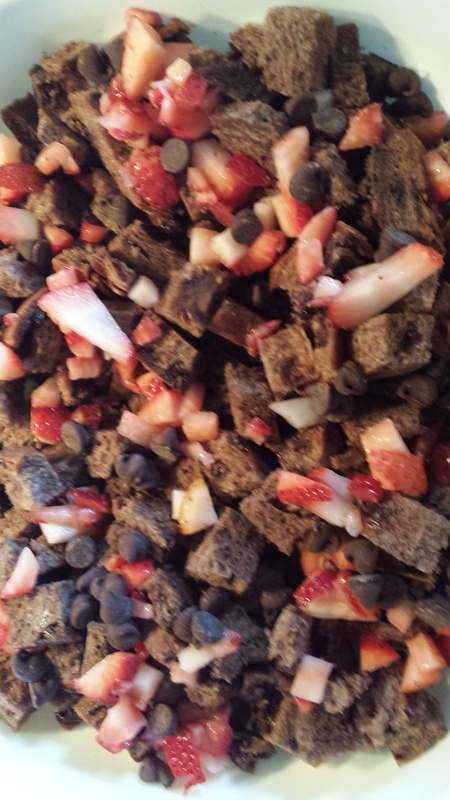 Then add diced strawberries and chocolate chips. Then slowly pour your base over the bread (about half used), making sure you spread evenly. Add another layer of bread, and repeat. Once done, let this stuff sit and soak for about 40 minutes (stirring gently at 20 and then again, gently, at 40.) At this point, you’re ready to bake. If you want to take this mixture and spoon it into muffin tins, go nuts. Spoon like nobody’s watching. Bake it. But cuddle it a little. Take the larger casserole dish and fill it 1/4 with water. Then rest the stuff you’re cooking in that water bath. Ban Marie. Great for terrines and custards, though the truth is, I’ve never made a terrine so the web could completely be lying to me. You’ll want to go at it for about 50 minutes straight. Slide the Ban Marie out, stick a knife in the center of the pudding and see if it comes out clean of everything other than chocolate. If it does, it’s ready. If it doesn’t keep cooking until it does. I had to go for 75 minutes because I went with a deeper dish. Variables. They change things you know? Let it set. When done, take it out of the oven and let it cool for 20. Then eat it in the best way possible — your way. I prefer taking the pudding out in a square and crisping the base on a skillet. Super wild contrast in flavors and textures at that point. But I don’t need or expect you to get it. That’s the good word. I think it was a good bread pudding. I’d probably flavor the custard a bit more, be prepared to soak up some more of the custard with some additional bread, and perhaps think of a legit topping (strawberry glaze? more chocolate? powdered sugar?) I’ll let you know if I do by editing this in the future but my guess is, I won’t. Pictures below to follow along if you’re interested. I threw out my back a few days ago. Why? Because I’m old. And my body is about 20 years older than I am. It’s a good feeling to be only 39 but have all the aches, pains, and physical ailments of someone approaching retirement. What that means is for the past three days I’ve been pretty worthless as a Dad. Priya’s had to do most of the work for Anaiya; I can sit and feed her, maybe change her, but really, I’m worthless. I woke up this morning feeling a little better but still worthless. 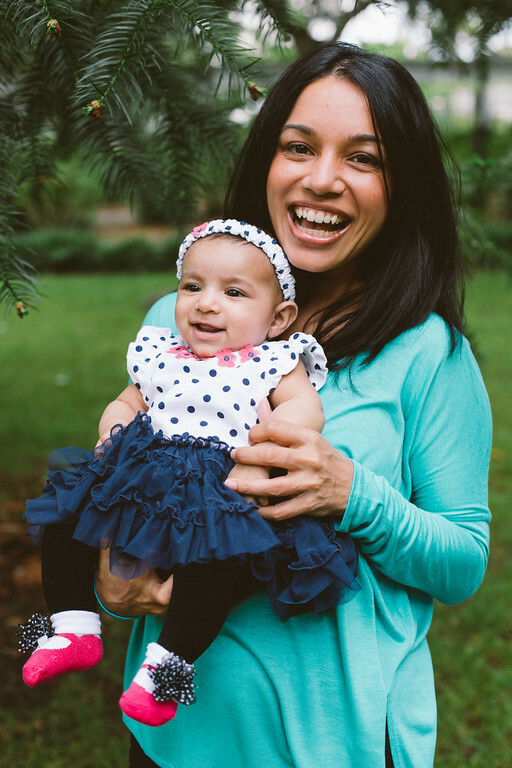 Priya was scrambling to get ready for a family event and I could do so little to help. Except try and make her breakfast. In her scramble to get through the morning she wasn’t going to eat. She wasn’t going to have time for it. I had to do what I could to help on this front. 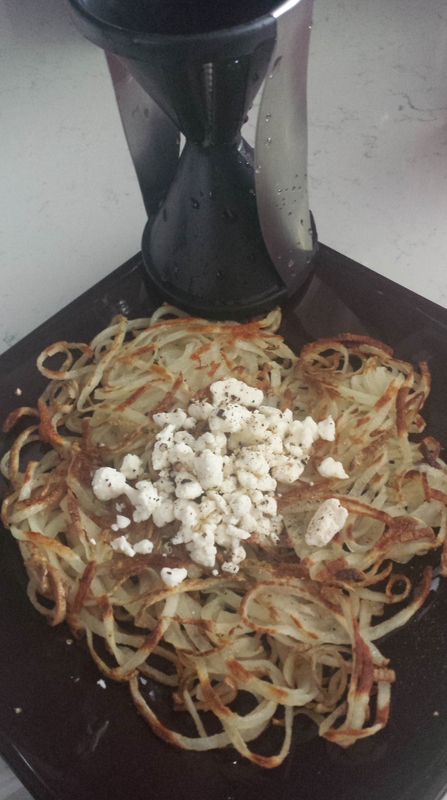 I looked at the new veggie spiral slicer I bought, saw one remaining potato, was inspired. In 15 minutes I whipped up a solid breakfast and actually redeemed myself a little bit. A tad. The moral of this story? Buy a veggie spiral slicer. It’s amazing. Prep your potato. If you have a spiral slicer, you’re talking about a minute of screwing the potato into the slicer. If you have a grater, you’re talking a little more time. I rinsed and scrubbed the potato, left the skin on, and got after it. 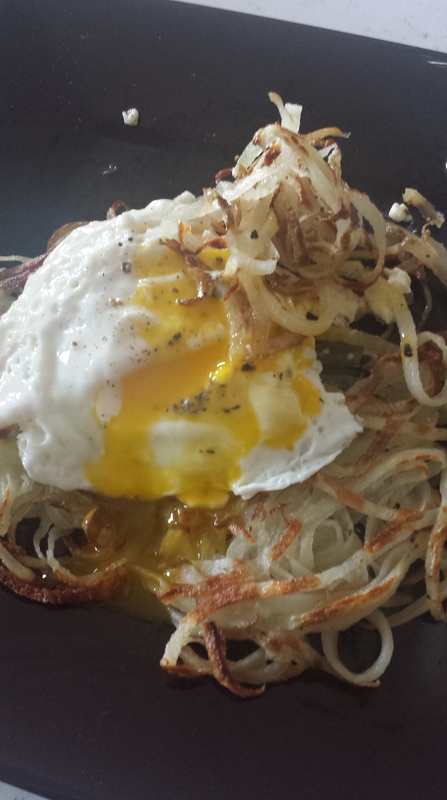 In a minute, I had a pile of beautifully spiral shredded potato. Cook the potato. Lay the potato around the pan evenly. Make sure everything’s interconnected, like a bird’s nest. Cover. Reduce to medium heat. Let cook for about 5 minutes. Remove the cover. Turn the potato (it should flip all together at this point.) Add a little oil if you want and then cook open on medium heat for another 5 minutes. Prep the plate. The egg should cook in about 2-3 minutes. 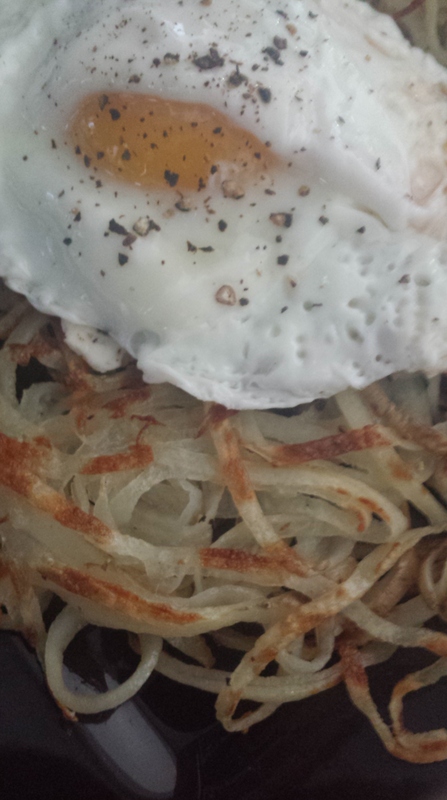 Slide it onto the potato nest, crack a little more sea salt and pepper on top, and serve. It’s beautiful. Healthy. Simple. Filling. And it made Priya happy. Win. Win. Another crock pot recipe for those who care. I’ve actually made versions of this recipe before; but I wanted to see if I could make it in a crock pot. Set it and forget it. It’s typically a high set up, high maintenance, customized presentation piece — a variation of this recipe is what I used as my cook to impress dating recipe. It worked on my wife so I feel like it was fairly well perfected. Now I needed to figure out how to cook this thing as a husband and a Dad. The game changed. It’s about volume, speed, efficiency, all without compromising taste. I don’t usually start with a summary but for this dish it feels like the right move. The dish stacks up as follows. Layers of eggplant, tofu ricotta, and portobello caps separated by a homemade tomato basil sauce. I just made this up as I went along but the dish should play out well as recreated below. For example, I thought about the pesto at the very last minute, so I whipped it up based on what I had in the house (spinach, walnuts.) I make this dish to taste … so taste everything before you assemble! Eggplant – Slice them however you want. Lengthwise. In circles. The goal is to leave the skin on, leave them at equal thickness, and enable yourself to cover the entire base of your crockpot. I went with circles for a majority and then cut some of the remaining circles into half circles to fill in the gaps. Salt them generously on either side and leave them on a paper towel for 25 minutes. You’re sweating out the water. Walk away. Walk. Away. Mushrooms – Clean the heck out of the caps. Lightly season them with salt and pepper. Lightly brush them with olive oil. Bake them on 350 for 15 minutes. Expect them to sweat out quite a bit of water so get a plan with some lip. After these have cooked, save the excreted mushroom water in a separate bowl and then put the Mushrooms on a plate, covered. Eggplant Revisited – Brush off the salt and sop up the water (paper towels are fine) then prepare them as you would the Mushrooms, but be a little more generous with the olive oil. Bake them at 350 for 25 minutes. Move on to the tofu and the sauce. Tomato Sauce – Easy peasy. Coat a saucepan with olive oil. Pour in the tomatoes and the mushroom water. Season to taste (salt, pepper, crushed red pepper, handful of basil leaves diced, 1 clove of garlic.) Let it simmer a bit. Toss all of this into a blender and get it to the consistency you’re looking for. Taste it and make sure you like it. Consider lemon juice, sugar, or more tomato depending on how the flavor is working for you. Rinse out the blender. You’re going to need it. Tofu Ricotta – Easy peasy, but you’ll need a spatula and some blender shaking experience. Crush the silken tofu to as fine a paste as you can with a fork. Toss in a half a bunch of basil. 4 Tbsps of Olive Oil. 1 clove of garlic, Salt, Pepper and Crushed Red Pepper to taste. Blend it. It should come out the consistency somewhere between a small curded ricotta and a smooth cream sauce. If you’re having difficulty blending it, feel free to add a little bit of water to get the blades whirring. Taste it and make sure you’re comfortable with the taste. This is a texture layer so you should like it but keep the flavor in context of the full dish. Pesto – Take the spinach, the remaining basil and garlic, equal parts olive oil, walnuts/pine nuts (1 cup), and parmesan, and season to taste (salt and pepper.) Blend. Taste and adjust until you like it. Set aside. You’ve not got all the components together; it’s time to assemble. Use 2 Tbsp of Olive Oil to coat the bottom and sides of the crock pot. A spray is fine as a base but use the OO for texture and flavor. Add a layer of sauce. Then lay down the eggplant on top of the sauce. Cut pieces to ensure you have full coverage. Spoon and spread pesto over eggplant. Make sure the eggplant is well covered. Add the mushroom caps. Distribute them the same way you distributed the eggplant. Try and cover the full pot; get creative with how you cut the mushrooms to get there. Add a final layer of sauce. Top the sauce with parmesan cheese. After cooking, remove the pot from the cooking unit and let set for 20 minutes. Top with basil leaves ribboned if you’d like. But otherwise, you’re ready to eat. When you’re done, this is heavenly. You can eat it on its own, serve it over pasta, or put it in a sandwich. You’ll enjoy it. The simple things. Sometimes it doesn’t matter what kind of options you have available to you, the simplest of things done just right and consumed at the perfect time make for magical moments. Tonight I had that experience with toast. Juicy. Butter play toast. For. Real. Butter bread. Avoid nooks and crannies so butter doesn’t leak when toasted. Toast bread to golden. It will take a little bit longer than usual but wait for it. Drizzle maple syrup on bread. Top off with a few sprinkles of salt. The balance of sour, sweet and salty. The crunch of the toast giving way to soft, butter soaked center. Everything in concert. Just magical. Here’s the next recipe. I went soup again. But this time, I went all vegetarian. If not for the parmesan rinds, it would be vegan. And I think you could substitute two tablespoons of soy sauce for each rind and get pretty darned close to what you have here. I love mushrooms. I love cream of mushroom soup. One of my favorite specialty recipes when I was young (sub-twelve) was to make an omelette and then spoon some warmed cream of mushroom soup overtop of it as a sauce. I had breakfast game pre-12. Mushrooms were the reason. For this soup I wanted to find a way to recreate and then elevate my Campbell’s memories. Mission accomplished. Clean the mushrooms. Probably the biggest pain. Clean them all. Lightly coat the bottom of the crock pot with olive oil. Add 1 cup of water. Toss in the remaining mushrooms, parmesan rinds, and the bay leaves and start cooking on low heat. After the stock is completed, split it. Put half directly into the crock pot. Blend half at high speed (Vitamix is clutch here.) Make sure the parmesan rinds are in the blender. This will effectively cream and turn into the base for your soup. Pour that half into the crock pot as well. Look at your soup and its consistency. Add water to get you to your desired consistency. I’m going to say 1 cup additional minimum. If you want fewer actual mushrooms (I wanted my soup hearty), blend more of the mushrooms. Turn the crock pot up to high and let this cook for 2.5 hours minimum. The soup itself will cook through all of the mushrooms beautifully though you may want to stir this a few times to turn the soup mixture over. Taste it. If you want or need more salt, pepper, or garlic, add it. When it’s done, you’re done. And it is beautiful. Silky. Earthy. Rich. But guiltless. In the picture I topped it with some shredded parmesan but it’s absolutely not necessary. I love soup. I never make it. My sister does and she’s awesome at it. Which is part of the reason I don’t make it. Relative economic efficiency, I guess. I always make other stuff. But when I looked under my cabinet one day to see these two beautiful crock pots, completely unused, something inside me clicked. And I found myself recently inspired to go crazy with those crock pots. In the past three weekends I’ve made four dishes which have garnered some serious rave reviews. I don’t remember the exact recipes because I kind of made them up as I went along. That being said, I figure I might as well share what I do remember and leave the rest under the “season to taste” category found in many recipes. The first recipe? Chicken and Mushroom Soup. The goal for me first and foremost is hearty. I want to make any food I make feel substantive and hearty. In this case, I didn’t want to do this with noodles. To me, that’s a cop out. So I instead focused on the chicken and veggies to make it work. Fresh mushrooms, sliced or cubes. Go crazy. I used a mix of Bellas and Creminis – 4 small baskets. Pull the chicken fully off the bone. Tear it or rough chop it but I kept it in fairly large sizes. Make your own stock. I put all of the chicken bones in a pot, added (to taste) butter, salt, pepper, cayenne, parmesan rinds, and water, and then boiled it for a good 90 minutes. I used 5 cups of water for reference given the size of the crockpot. Clean the mushrooms. And then either slice of cube them. But no need to sautee or anything. 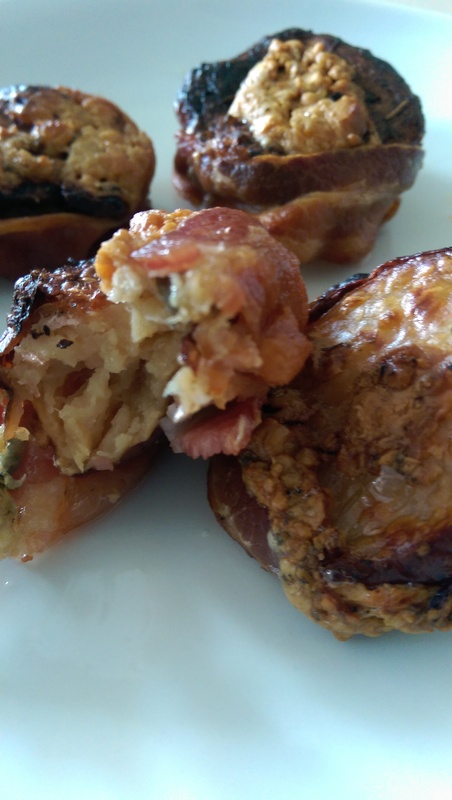 These preserve themselves well in the slow cooker method. Mandolin slice the baby carrots. Rough cut the celery (I went about 1/3″ pieces.) I like the contrasting sizes but basically, get carrots and celery into your crock pot. Lightly coat the bottom of the crock pot with olive oil. Toss everything into the crockpot. Add the homemade stock (including the parmesan rinds.) Add additional water depending on the consistency you’re going for. And cook on high for 4 hours. If you want to start the chicken and soup actually going, put half of the water from the stock, the celery and the carrots into the crock pot to start and go from there. If what comes out isn’t the best chicken soup you’ve ever had, you’re doing something wrong. Or I have ridiculously low standards. The soup crushed it. Screw noodles. Overdone with chicken IMHO.